Home/Articles/How much have goalkeepers and goalkeeping really changed? How much have goalkeepers and goalkeeping really changed? It’s something we hear mentioned a lot at all levels of football and at all ages, sometimes by the completely uneducated when it comes to goalkeeping and sometimes from professional goalkeeping coaches and even goalkeepers themselves. People are always discussing just how much goalkeeping has evolved over the years. Would the greats like Peter Schmeichel and Oliver Kahn fit into today’s faster, more technical and rounded role of a goalkeeper? Would goalkeepers such as Maty Ryan and Claudio Bravo standing at 6ft tall have ever been given the opportunity to play at the absolute top table given their height, or would they have been cast aside for a 6ft 5 giant? Just how important is distribution nowadays, when keepers have to be a genuine outlet for the team and able to pass and distribute the ball as good as; if not better than some of their defensive team mates. 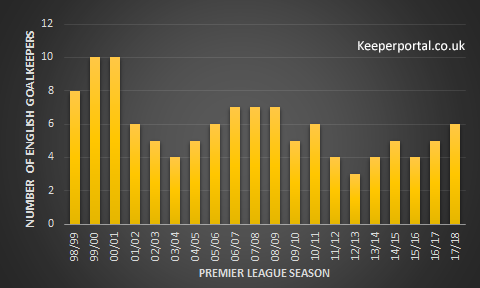 So in a world where every statistic is gathered and collated for anyone to find, we thought we would take a quick look at some of the statistical trends around goalkeeping over the last 20 years in the English Premier League. Has the average height of goalkeepers changed much in 20 years? As a goalkeeper growing up, height seemed to be everything – my idols were giants; it seemed like every goalkeeper was 6ft 3 whether it be Buffon, Schmeichel or Seaman – although out in the slick, fast flowing and technical Spanish leagues Valdes and Casillas were showing that you didn’t necessarily need the height to play at the very top. As the English game has apparently evolved and goalkeepers in the Premier League are being asked to play out from the back, start attacks and sweep up in defence then there seems to be a school of thought that height, whilst still important in that there is a lower limit of around 6ft – is becoming less important and technical ability is taking over. So, has the average height of the goalkeepers in the Premier League really changed that much? We took a look at the heights of the 20 goalkeepers in each season who had the most appearances to get an average height for each season and the result are below! Well actually, it turns out that the average height of goalkeepers in the Premier League over the last 20 years has gone up – a tiny bit at least. A more detailed look though, shows it’s actually been pretty consistent across the last 20 years, the lowest average of the whole period was 188.9cm (6ft 2.37in) and the highest was 192.9cm (6ft 3.94in) so a movement of around 1.5 inches. Averages don’t always tell us everything though, so we took a quick look at the smallest and tallest goalkeepers over the same period. In total the 20 seasons gave us 117 individual goalkeepers, only 10 of these goalkeepers had been 6ft or under, with only 1 keeper being under 6ft which was Manchester United goalkeeper Fabian Barthez at 180cm (just under 5ft 11). So it looks like that 6ft minimum height cap is absolutely still there at the very top. Whilst there is hope for goalkeepers to be the exception and make it at 6ft, the harsh reality is that in the 17/18 Premier League season, the average height was 192.7cm (6ft 3.87in). Just to state the obvious, that is incredibly tall! In fact, when measured against the adult male population in England you’re talking about the 99.049th percentile for height, in other words – less than 1% of adult males will ever reach that height. Has the number of English keepers dropped since money took over? The Premier League and the vast sums of money involved in today’s game is often blamed for the ‘poor performances’ of England’s national team. Premier League clubs are powerhouses in financial terms compared to some of their European and Worldwide competitors and therefore can purchase players from any league in the world. Whilst this makes for an incredibly competitive and exciting domestic league, it’s often said to restrict opportunities for English players in general and also for goalkeepers. So has the number of English goalkeepers changed over the last 20 years? In the 1999/2000 season, 19 years ago – 10 of the goalkeepers out of the 20 who made the most appearances were English and this year there are only 6 – a 20% drop. 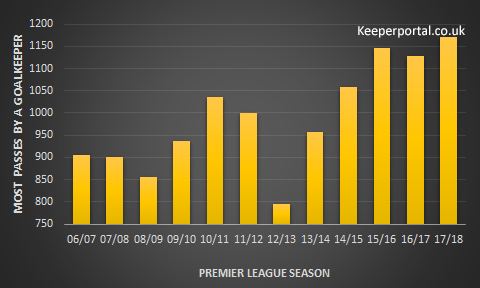 However the graph also shows us that things are better than they have been, in 2012/13 there were only 3 out of the 20 goalkeepers who were English, so to have seen that number double in 5 seasons is pretty impressive, particularly with the emergence of some fantastic young talents such as Jordan Pickford, Nick Pope and Jack Butland who are all currently fighting to be England’s number 1 at the World Cup this Summer. Are goalkeepers really using their feet that much more to become an extra defender / attacker? We know there are certain goalkeepers who are absolutely changing the image of the goalkeeper; players like Ederson and Ter Stegen who demand the ball under pressure and recycle it out to their players with speed and precision to launch devastating counter-attacks against anyone who dares to press them. But are they that special or is this just something that is getting more attention recently? For this we took a look at two statistics, the number of passes the goalkeeper with the most passes made in one season and how many goalkeepers in a season made over 800 passes. Unfortunately the Premier League statistics for passes only go back 12 years but it still gives us some interesting information. First lets look at how many passes the goalkeeper with the most passes is making per season. Clearly, there has been a change – even the goalkeepers who used to be known for playing out from the back were never passing the ball around as much as goalkeepers in today’s game – bear in mind 17/18 season isn’t finished yet! But, it’s not as big an increase as some would have expected, 7 seasons ago in 2010/11 it was 1036, last season it was 1127 – only 91 more over an entire season. What about that second statistic? 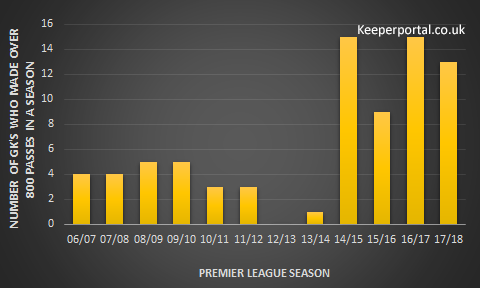 How many of the 20 Premier League goalkeepers made more than 800 passes in a season? Wow! 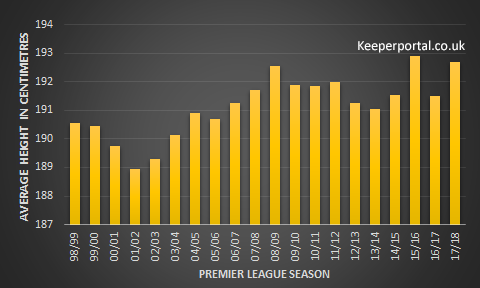 So whilst the number of passes have gone up slightly over the years, and it looks like this year will be a record, actually the biggest change isn’t that the top keepers are making more and more passes but rather that more and more goalkeepers are being asked to play this way. Out of 20 goalkeepers last year 15 made over 800 passes in the season, 3 years earlier only 1 did and the year before that? None. There is no escaping this statistic, want to play at the top? Be prepared to work on your ability to receive and distribute the ball! Average height for goalkeepers over the last 20 years has gone up, but only a little. Realistically 6ft is still the minimum height, but 6ft 3 – 6ft 4 is the average. English keepers seemed to be being forced out of the Premier League a few years ago, but they are back and fighting! The top goalkeepers are passing the ball more than ever, but more interestingly is that all goalkeepers are being asked to pass the ball far more than they ever did. Thanks for taking the time to read this post, let us know if you’ve noticed any trends of your own over the Premier League era. We will finish with a caveat – all statistics are believed to be true and accurate but when collecting large amounts of data there is always the opportunity of human error. In addition to this, in some circumstances statistics around things such as height are generally believed to be slightly exaggerated, particularly in smaller goalkeepers.  But for the purposes of accuracy we have assumed all data to be accurate as reported.